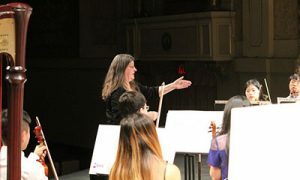 Maestra Yvonne Collins is in her 29th season as Conductor of the Montgomery Youth Orchestra. Both a violinist and a pianist, she is also the Montgomery Symphony Orchestra’s Principal Second Violin. A native of Chattanooga, Tennessee, Maestra Collins attended Tennessee Tech University where she studied conducting with Robert Jager. She as performed with the Chattanooga, Albany and Auburn symphony orchestras and founded Joyeux Musique, a local string trio. She is a member of the Eastmont Baptist Church Orchestra and plays regularly with Frazer United Methodist and St. James United Methodist churches.